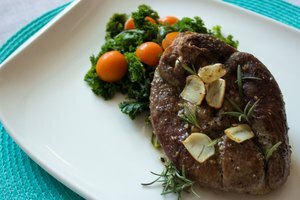 Lamb leg steaks are a great piece of meat to have on hand because of their versatility and easy preparation. 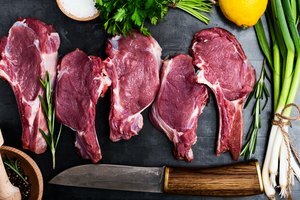 Leg steaks are suitable for frying, barbecuing, grilling or roasting in the oven, making them perfect for a quick dinner. Herbs such as mint and rosemary are classically great, but spices and anchovies can also be added for an extra kick. Feel free to try any flavor profile you'd like though, as these great cuts can comfortably mesh with lots of flavors. Combine crushed garlic, rosemary leaves and olive oil in a bowl and mix. Feel free to include spices like paprika and cayenne pepper or chopped anchovy. Add the lamb steak to the mixture with salt and pepper. Ensure the steak is covered completely by the marinade and leave for two to three hours. Heat oil in a frying pan until it's very hot. Fry the lamb steak for two minutes on each side if you want it medium rare or five to six minutes if you want it well done. Remove from the pan and leave to rest for a minute before serving, as it'll continue to cook. Follow the steps above to fry the steak, cooking on each side for about two minutes. Transfer the lamb to an ovenproof dish with a little oil and place in the oven. Cook for five to six minutes if you like your steak medium rare, or a little longer if you want it well done. Remove from the oven and leave to rest on a plate. 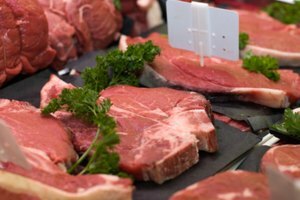 When buying lamb, look out for yellowish or crumbly fat. This means the meat is old -- don't buy it. 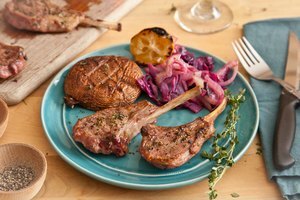 Make sure you keep the lamb in the coldest part of the fridge and if it's raw make sure it doesn't come in contact with other food. Lamb will keep in the fridge for around three days. However, smaller cuts should be eaten on the day of purchase.